viaLibri ~ BRITISH COLUMBIA, And Vancouver Island; Comprising a Historical Sketch of the British Settlements in the North-West Coast of America; And a Survey of the Physical Character, Capabilities, Climate, Topography, Natural History, Geology and Ethnology of That Region. Compiled from Official and other Authentic Sources. 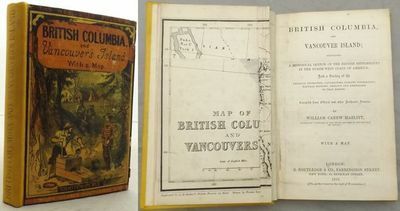 BRITISH COLUMBIA, And Vancouver Island; Comprising a Historical Sketch of the British Settlements in the North-West Coast of America; And a Survey of the Physical Character, Capabilities, Climate, Topography, Natural History, Geology and Ethnology of That Region. Compiled from Official and other Authentic Sources. G. Routledge & Co. 1858. . 1st Ed. 12mo. viii + 247pp. + [i] + [ii]. publ. adverts. Folding frontis. map (sm. repair to verso). Some light marginal browning, new e.ps., rebound in yellow cloth with original yellow paper pictorial wrapps. laid down to boards, some minor marginal loss to paper wrapp. Sabin C 31126; Lowther 73, Lande 1219, Smith 4272.